Фенотиазинови производни СВОЙСТВА: Фенотиазините са разтворими в липиди, бързо се разпределят в биомембраните. Съдържат един или два базични N атома, които дават възможност за образуване на водноразтворими соли. 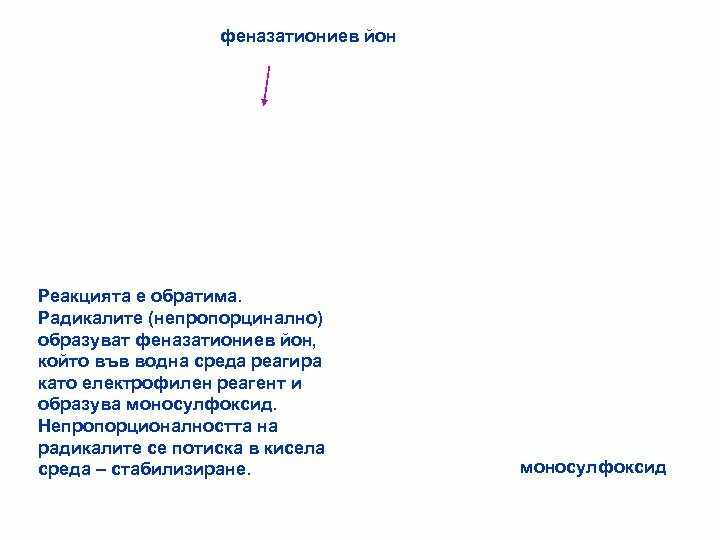 Представляват бели кристални вещества. 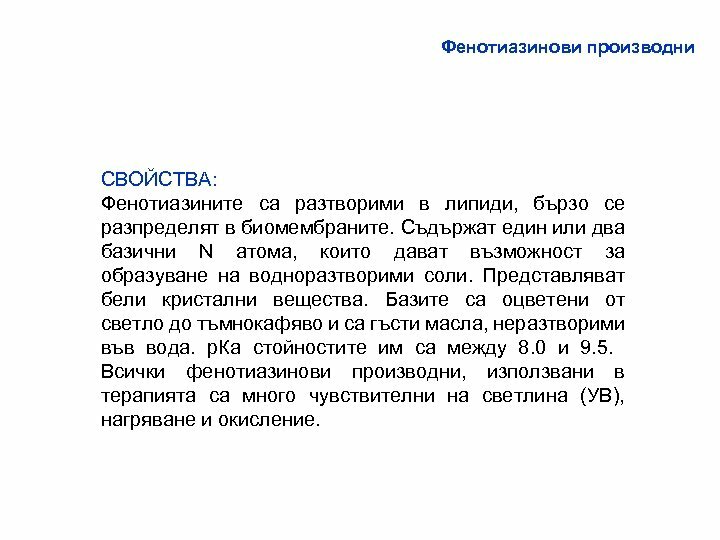 Базите са оцветени от светло до тъмнокафяво и са гъсти масла, неразтворими във вода. 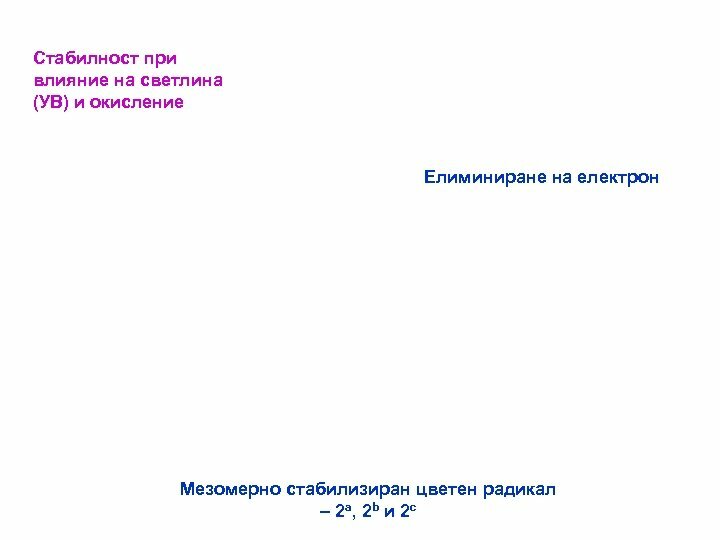 р. Ка стойностите им са между 8. 0 и 9. 5. Всички фенотиазинови производни, използвани в терапията са много чувствителни на светлина (УВ), нагряване и окисление. 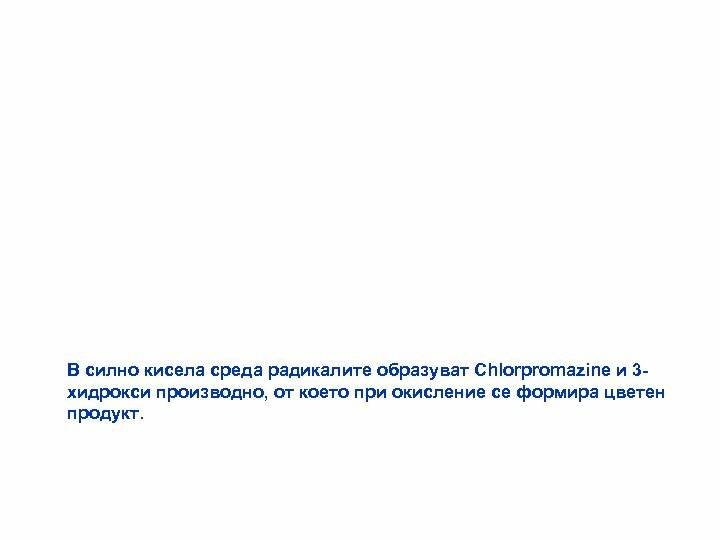 В силно кисела среда радикалите образуват Chlorpromazinе и 3 хидрокси производно, от което при окисление се формира цветен продукт. 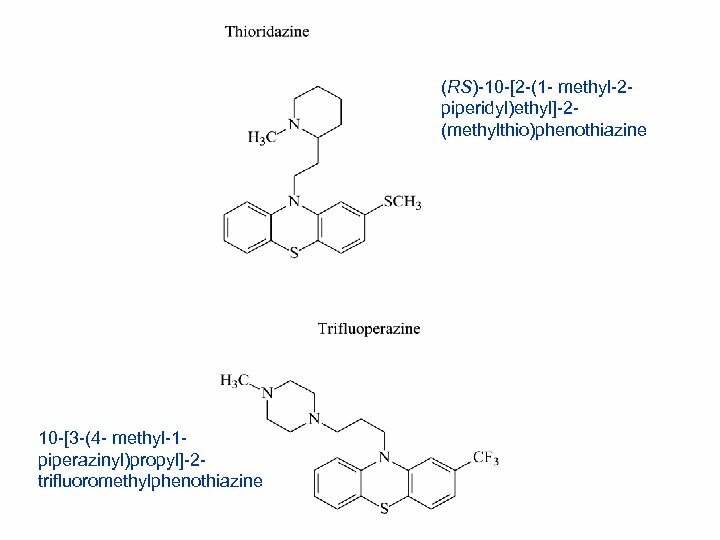 IDENTIFICATION OF PHENOTHIAZINES (Ph. Eur. method 2. 3. 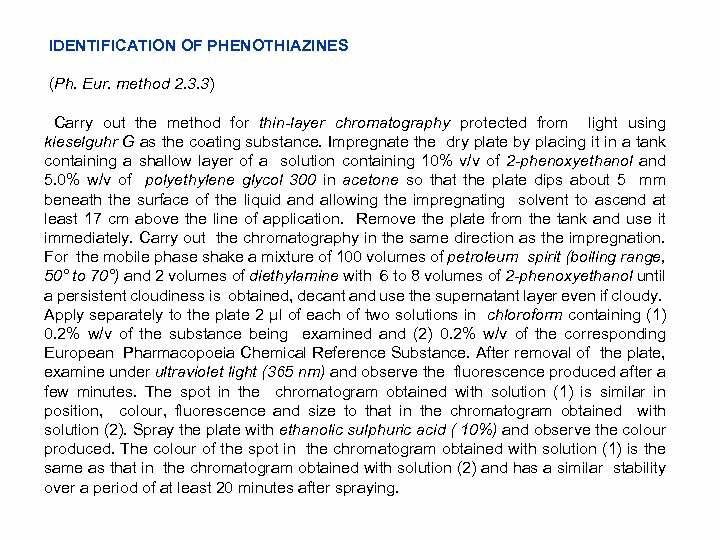 3) Carry out the method for thin-layer chromatography protected from light using kieselguhr G as the coating substance. Impregnate the dry plate by placing it in a tank containing a shallow layer of a solution containing 10% v/v of 2 -phenoxyethanol and 5. 0% w/v of polyethylene glycol 300 in acetone so that the plate dips about 5 mm beneath the surface of the liquid and allowing the impregnating solvent to ascend at least 17 cm above the line of application. Remove the plate from the tank and use it immediately. 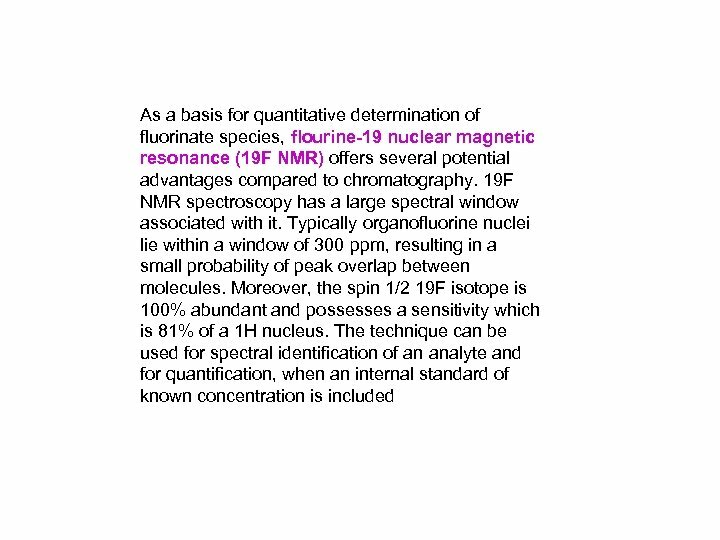 Carry out the chromatography in the same direction as the impregnation. For the mobile phase shake a mixture of 100 volumes of petroleum spirit (boiling range, 50° to 70°) and 2 volumes of diethylamine with 6 to 8 volumes of 2 -phenoxyethanol until a persistent cloudiness is obtained, decant and use the supernatant layer even if cloudy. 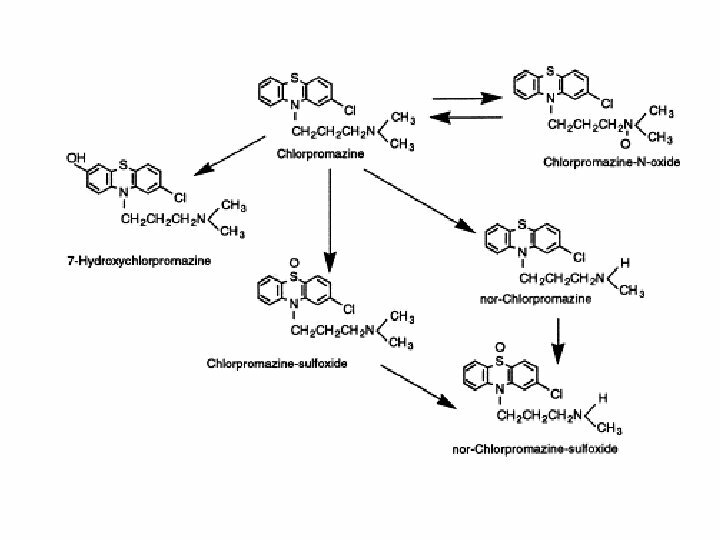 Apply separately to the plate 2 µl of each of two solutions in chloroform containing (1) 0. 2% w/v of the substance being examined and (2) 0. 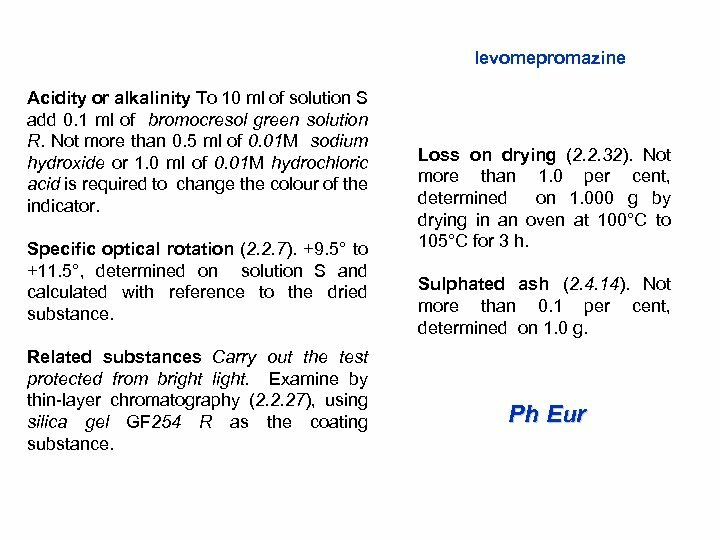 2% w/v of the corresponding European Pharmacopoeia Chemical Reference Substance. After removal of the plate, examine under ultraviolet light (365 nm) and observe the fluorescence produced after a few minutes. 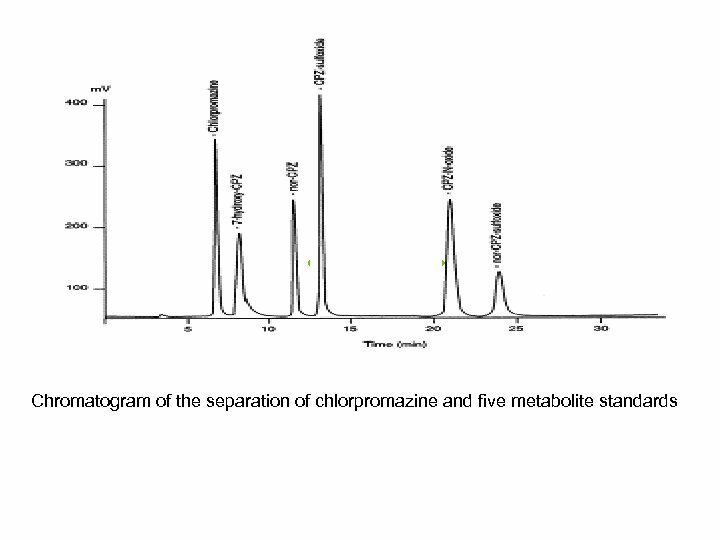 The spot in the chromatogram obtained with solution (1) is similar in position, colour, fluorescence and size to that in the chromatogram obtained with solution (2). Spray the plate with ethanolic sulphuric acid ( 10%) and observe the colour produced. 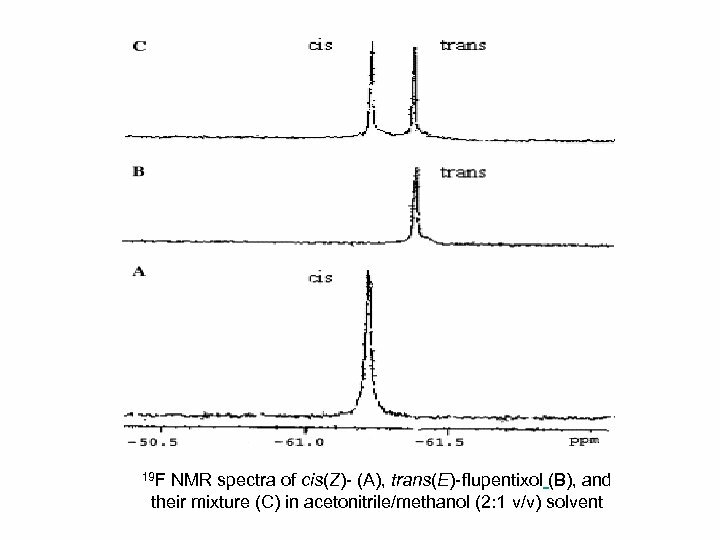 The colour of the spot in the chromatogram obtained with solution (1) is the same as that in the chromatogram obtained with solution (2) and has a similar stability over a period of at least 20 minutes after spraying. 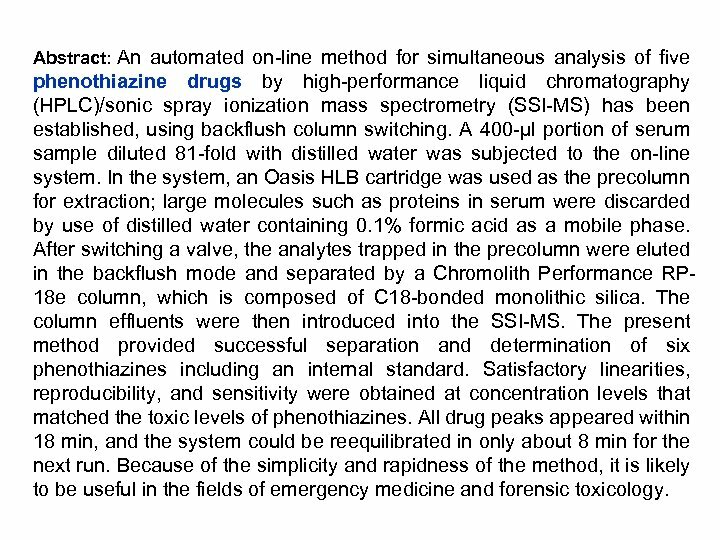 Abstract: An automated on-line method for simultaneous analysis of five phenothiazine drugs by high-performance liquid chromatography (HPLC)/sonic spray ionization mass spectrometry (SSI-MS) has been established, using backflush column switching. A 400 -μl portion of serum sample diluted 81 -fold with distilled water was subjected to the on-line system. 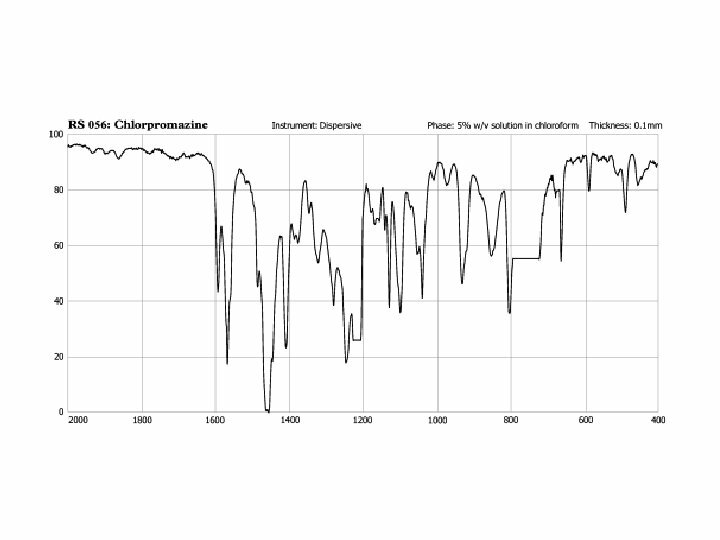 In the system, an Oasis HLB cartridge was used as the precolumn for extraction; large molecules such as proteins in serum were discarded by use of distilled water containing 0. 1% formic acid as a mobile phase. 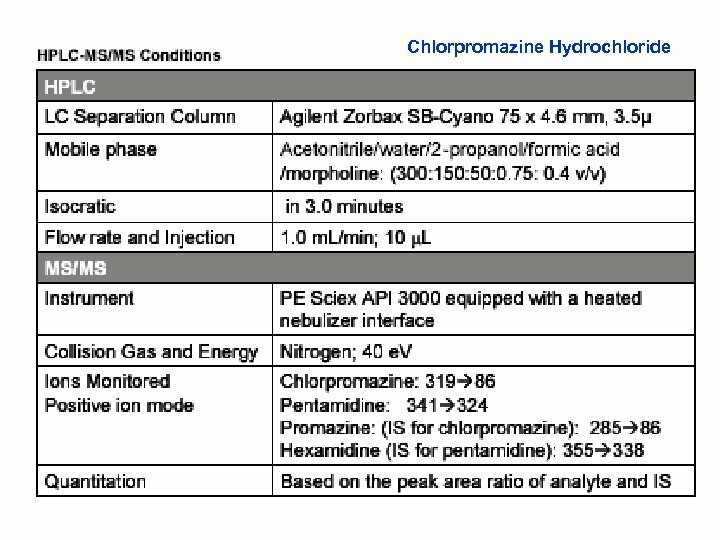 After switching a valve, the analytes trapped in the precolumn were eluted in the backflush mode and separated by a Chromolith Performance RP 18 e column, which is composed of C 18 -bonded monolithic silica. 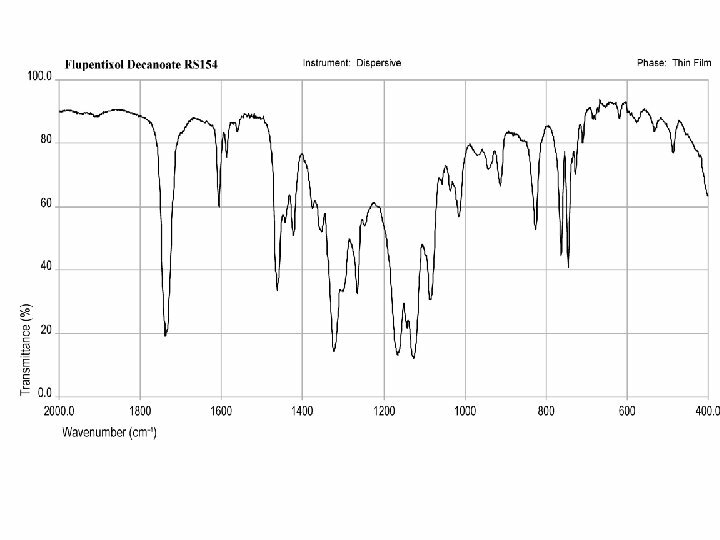 The column effluents were then introduced into the SSI-MS. 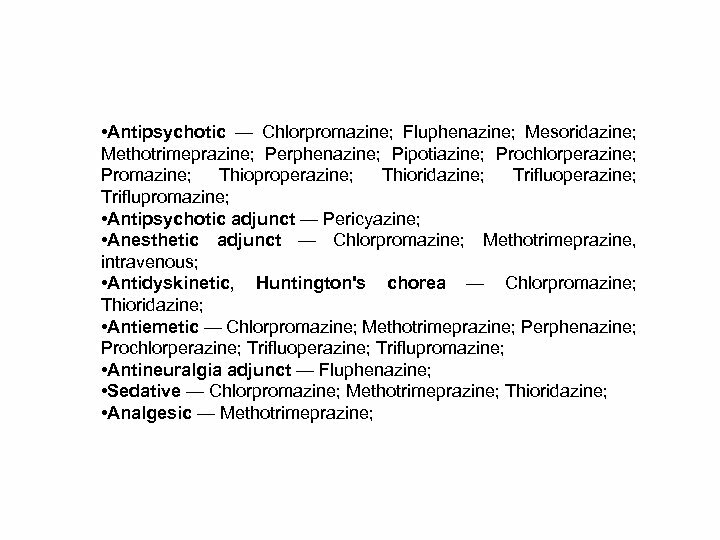 The present method provided successful separation and determination of six phenothiazines including an internal standard. 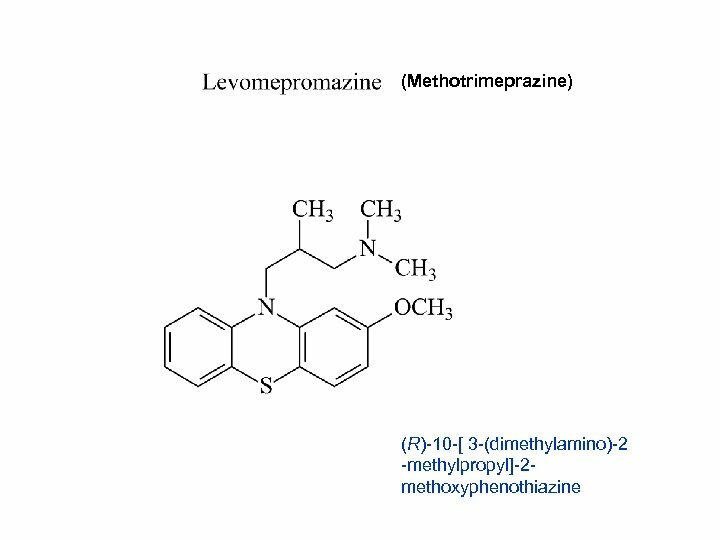 Satisfactory linearities, reproducibility, and sensitivity were obtained at concentration levels that matched the toxic levels of phenothiazines. All drug peaks appeared within 18 min, and the system could be reequilibrated in only about 8 min for the next run. 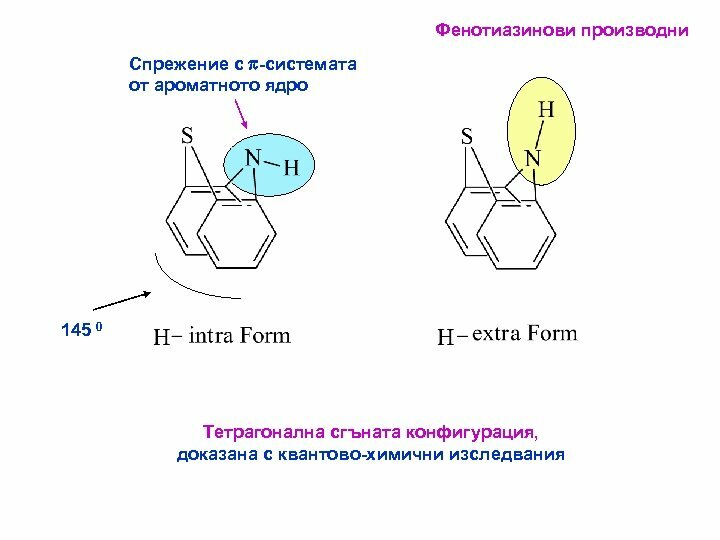 Because of the simplicity and rapidness of the method, it is likely to be useful in the fields of emergency medicine and forensic toxicology. 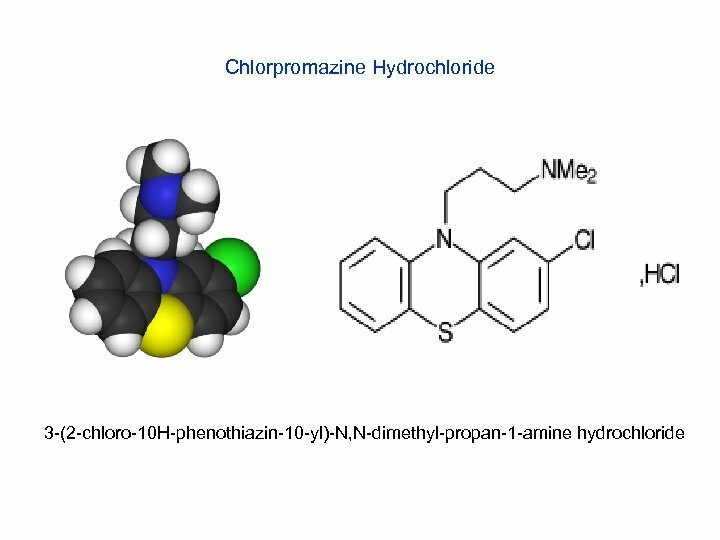 Тиоксантени Chlorprothixene (Z)-3 -(2 -Chloro-9 H thioxanthen-9 -ylidene)N, N-dimethylpropan-1 amine hydrochloride. 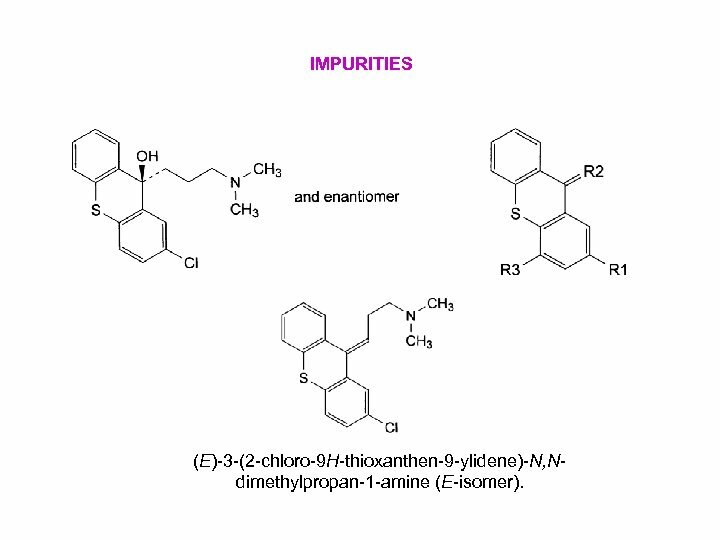 IMPURITIES (E)-3 -(2 -chloro-9 H-thioxanthen-9 -ylidene)-N, Ndimethylpropan-1 -amine (E-isomer). 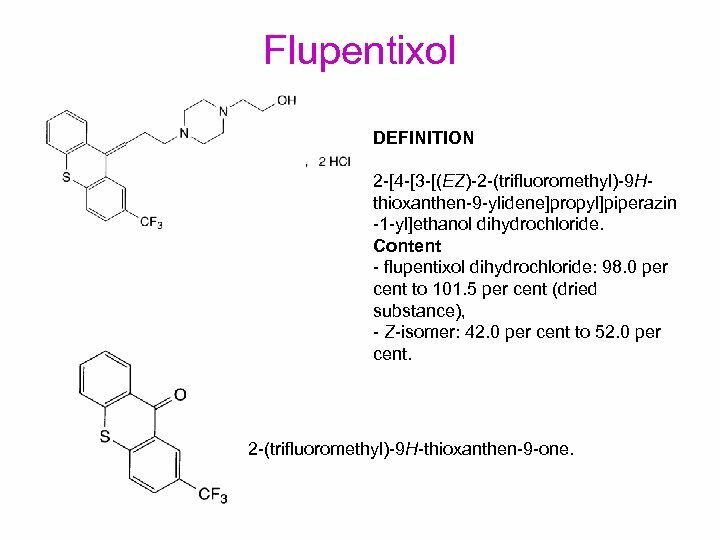 Flupentixol DEFINITION 2 -[4 -[3 -[(EZ)-2 -(trifluoromethyl)-9 Hthioxanthen-9 -ylidene]propyl]piperazin -1 -yl]ethanol dihydrochloride. 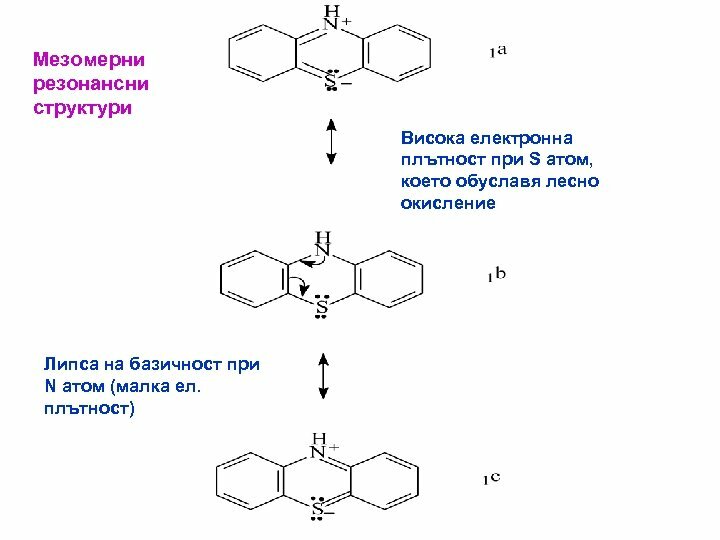 Content - flupentixol dihydrochloride: 98. 0 per cent to 101. 5 per cent (dried substance), - Z-isomer: 42. 0 per cent to 52. 0 per cent. 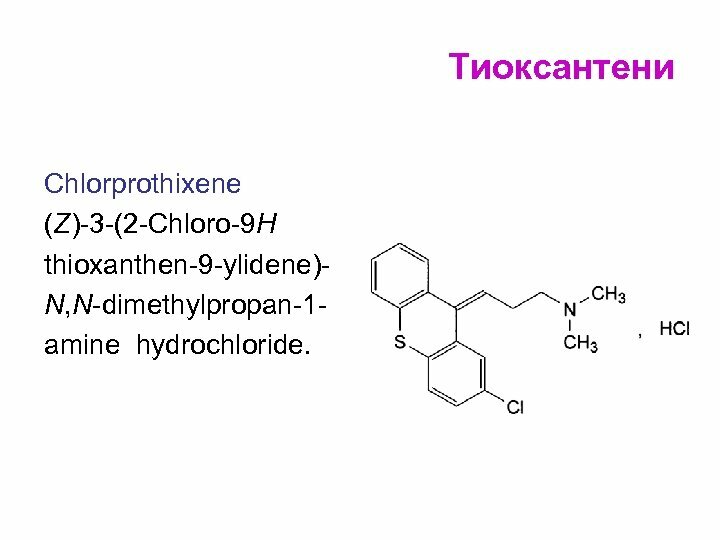 2 -(trifluoromethyl)-9 H-thioxanthen-9 -one. The structure of flupentixol is based on the thioxanthene ring to which the side chain is linked by a C=C double bond. 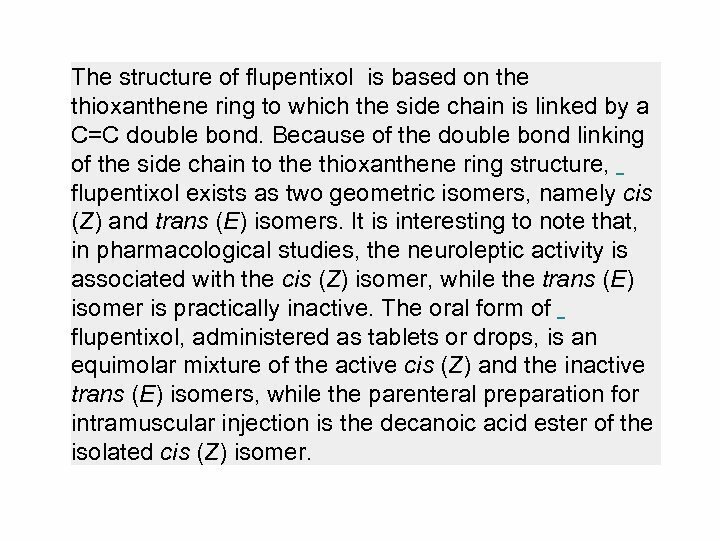 Because of the double bond linking of the side chain to the thioxanthene ring structure, flupentixol exists as two geometric isomers, namely cis (Z) and trans (E) isomers. 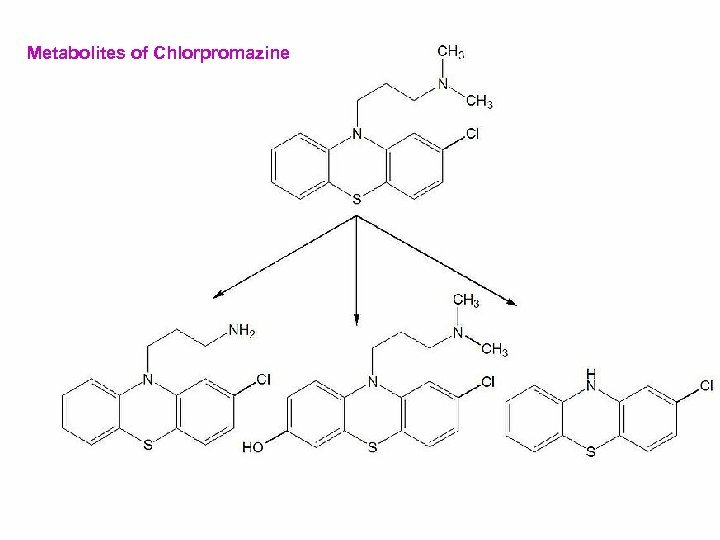 It is interesting to note that, in pharmacological studies, the neuroleptic activity is associated with the cis (Z) isomer, while the trans (E) isomer is practically inactive. 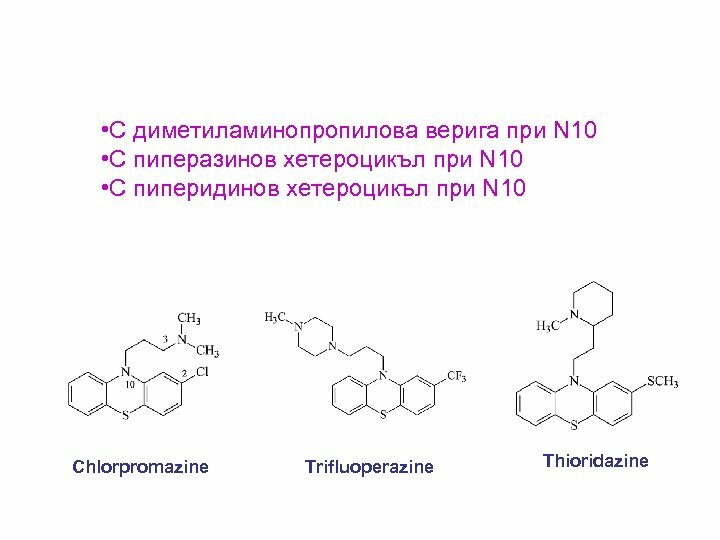 The oral form of flupentixol, administered as tablets or drops, is an equimolar mixture of the active cis (Z) and the inactive trans (E) isomers, while the parenteral preparation for intramuscular injection is the decanoic acid ester of the isolated cis (Z) isomer. 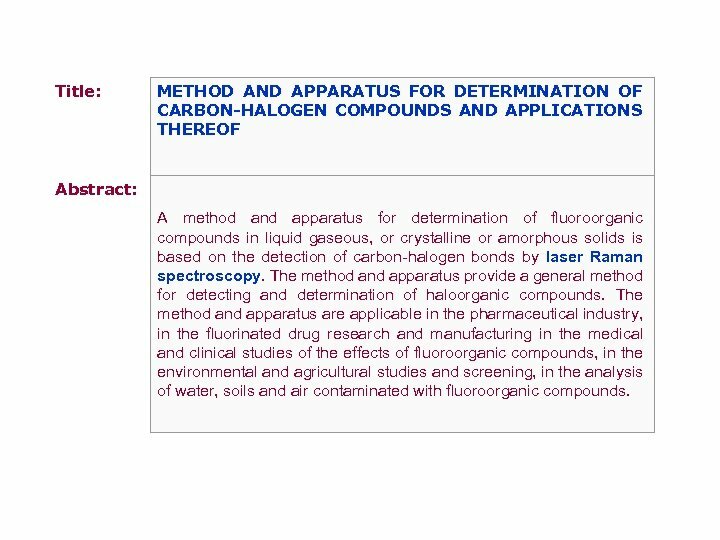 Title: METHOD AND APPARATUS FOR DETERMINATION OF CARBON-HALOGEN COMPOUNDS AND APPLICATIONS THEREOF Abstract: A method and apparatus for determination of fluoroorganic compounds in liquid gaseous, or crystalline or amorphous solids is based on the detection of carbon-halogen bonds by laser Raman spectroscopy. 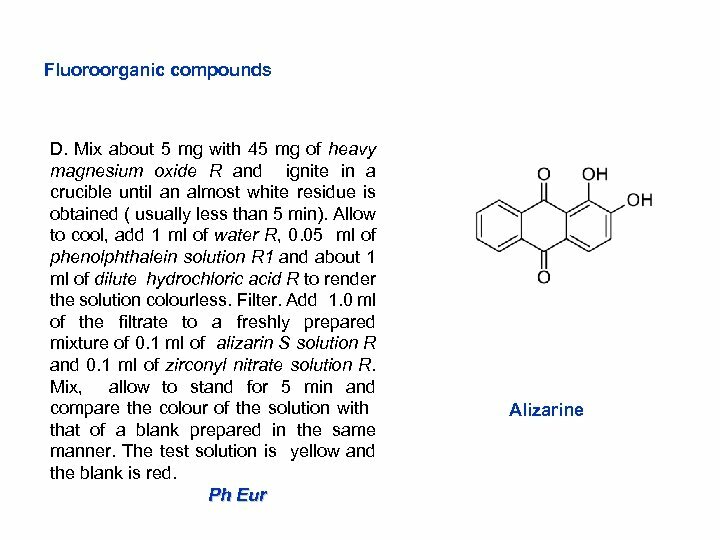 The method and apparatus provide a general method for detecting and determination of haloorganic compounds. 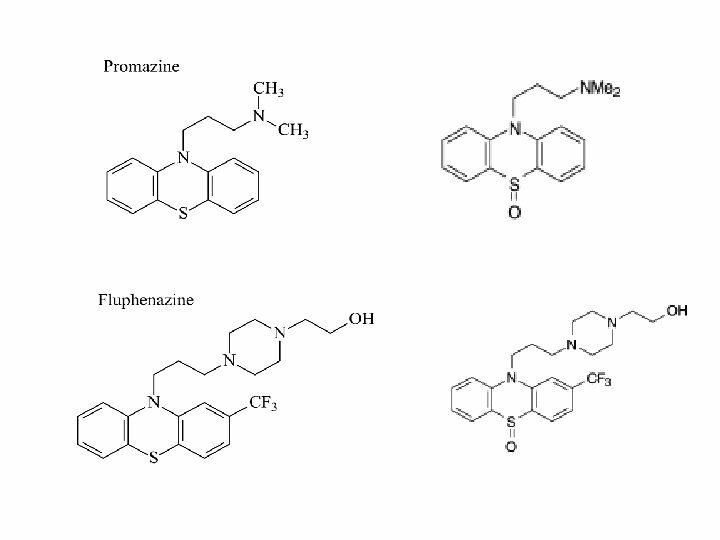 The method and apparatus are applicable in the pharmaceutical industry, in the fluorinated drug research and manufacturing in the medical and clinical studies of the effects of fluoroorganic compounds, in the environmental and agricultural studies and screening, in the analysis of water, soils and air contaminated with fluoroorganic compounds. Общие понятия и принципы экономических оценок в здравоохранении.